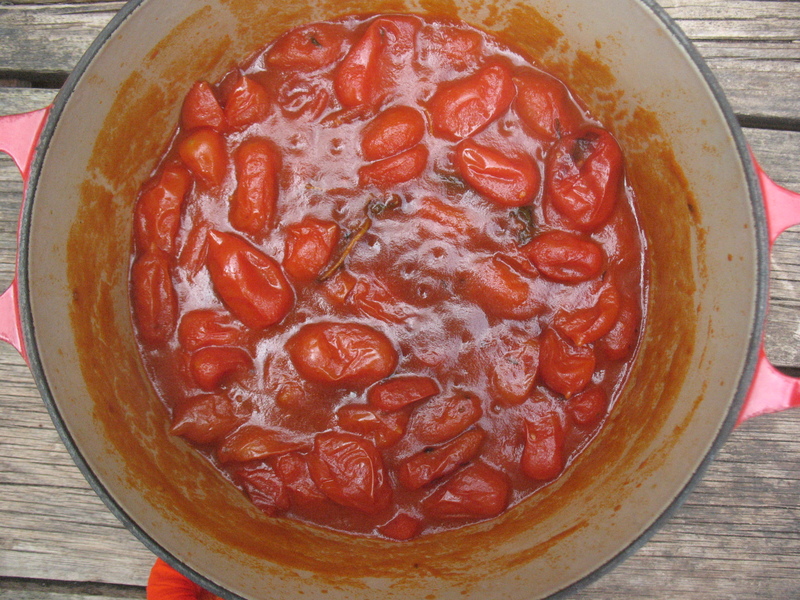 As promised in Stacey’s last post, I have finally finished this ‘Cherry Tomato Sauce’ post. (Thanks for the pics, Stace). Ever since sampling the ‘real’ pizzas in Italy a few years ago and hunting down the ‘authentic’ ones here, I have been experimenting with a sauce that replicates the simple version they use. This is as close as I can get it at the moment. I have discovered that to achieve that ‘real’ tomatoey taste, frying off the tomatoes in hot olive oil, so they caramelise, and a long-simmering and resting time is a must. After reading Stacey’s ‘Lasagne with a Creamy Basil Sauce’ post, it reminded of that lasagne I sampled many a time at her place, so I was inspired to make it myself, using this sauce as the base. I did not have any cream, so I substituted yoghurt instead which worked quite well. Next time, I’ll try ricotta instead of the cream. A very tasty lasagne, perfect for Winter and perfect for left-overs, which seems to be my eating habits at the moment. My other favourite uses for this sauce are: tossed through spaghetti and a generous helping of shaved parmesan and fresh, torn basil leaves; or as a pizza sauce on wholemeal Lebanese bread with bocconcini and mozzarella cheese and fresh basil leaves. Very simple, and a quick, tasty snack. Heat olive oil in a large heavy based saucepan (should be hot enough so that herbs sizzle when added). Add whole herb sprigs (no need to chop). Toss in the hot oil so that the flavour infuses and herbs turn bright green. Add whole cherry tomatoes (yes, no need to chop). Toss so that all are coated in oil. Add salt and plenty of pepper. Leave to sizzle on medium heat for about 5 minutes, stirring occasionally. Mix in tomato paste and sugar. You may need to add about a ¼ cup water (or enough to rinse out cans is if using canned tomatoes) to ensure the sauce is not too thick. Reduce heat to a simmer, cover and let stew away for about an hour. Turn off heat. Taste and adjust seasoning (sugar, salt and pepper). Use as is, without straining or mashing (some tomatoes should still be somewhat whole), or if prefer a smoother sauce, strain so that seeds and skins are removed. I prefer the unstrained version as the chunks are quite tasty. Serve immediately with a dish of choice (pasta or as a pizza sauce), or if using later, let sit covered at room temperature. Freezes well in airtight containers.